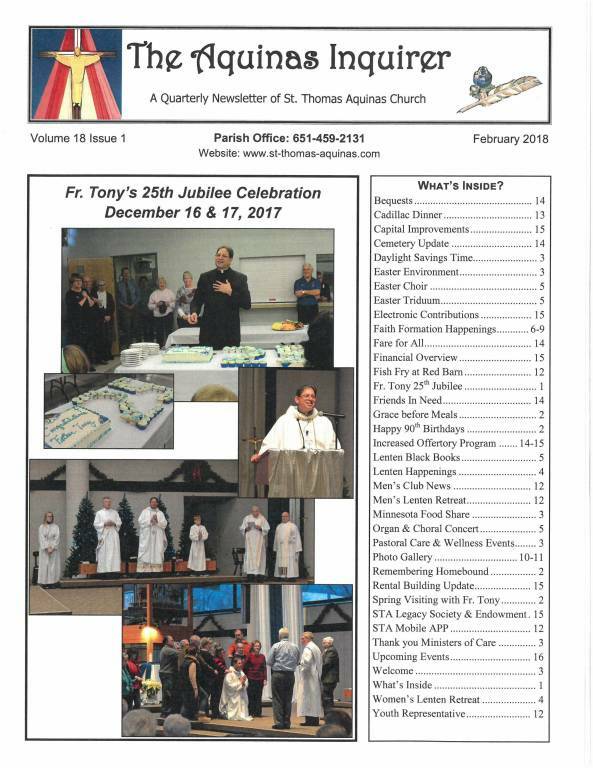 St. Thomas Aquinas publishes a quarterly newsletter, the Aquinas Inquirer, for all its parishioners. We welcome your input, feedback, and contributions; if you'd like to share your time and talents as a writer or photographer, please contact the parish office. If you have news and/or photos about your ministry that you would like in the next issue, please submit it to Mary Jo Luedtke at the parish office, 651-459-2131. The online versions of the newsletter are in Adobe Acrobat® format - if the free Acrobat Reader is not installed on your machine, you can get it by selecting this link.